This product is a 1-channel relay module board with LED indicators; it can be controlled by microcontrollers such as Arduino, AVR, PIC, ARM any other microcontroller operating at 5V. · This relay module is 5V active low. · It is a 1-channel relay interface board, which can be controlled directly by a wide range of microcontrollers such as Arduino, AVR, PIC, ARM, PLC, etc. · It is also able to control various appliances and other equipment with large current. · Relay output maximum contact is AC250V 7A and DC30V 10A. Ball caster wheel is an Omni directional wheel. This wheel can be used as a neutral wheel for the ro.. This 8 digits seven segment display module is based upon the Maxim MAX7219 LED display driver. .. The INA126 is a precision instrumentation amplifier for accurate, low noise differential signal ac.. 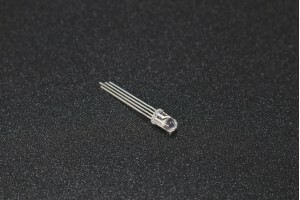 This is a simple 5mm LED with an interesting array of applications. This UV LED can be u..
ESP8266 is a highly integrated chip designed for the needs of a new connected world. It offers a c..